For hundreds of years, people have been choosing iron as their metal of choice for beauty and functionality. No door is quite as stunning as a wrought iron one—the curves and arches, the classic look, the intricate design… No offense to wood, but you’d pick iron any day. Here are a few reasons why iron is a superior aesthetic choice when you’re deciding on a front door for your home. How many people do you see with wrought iron doors guarding the entrance to their homes? Probably not too many, but when you do, you can’t help but admire them. A lot of people like to play it safe and go with a traditional option, usually wood. It’s the people with a creative vision, the ones who know what they want and aren’t afraid to break the mold, who choose wrought iron. One of the greatest things about a wrought iron door is that you don’t just have to buy the same design that every other iron door owner has. There’s a wide variety of designs to choose from, so you can get exactly the look you want, unique to your home. 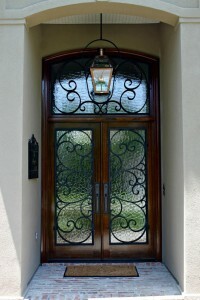 If you want to be really individual, you can even get your wrought iron door custom-made! And there are even variations in the actual materials used—you can opt for a blend of wood and iron, or save a little money by choosing a steel base and using wrought iron for the finishing touches. The level of detail on your door is also totally up to you. Want flowers worked into the metal? No problem. Prefer to keep it simple? Go for some classic curved lines up and down the windowpanes. All this is to say, if you like to march to your own drum, a wrought iron door is for you. Modern customization options mesh perfectly with a charm that evokes memories of eras gone by. They are elegant and classic, and they will give your home a dash of old-world European flair. Your visitors might think they’re entering a castle—and your home is your castle, so there’s nothing wrong with that! Of course, you shouldn’t buy a door just because it’s pretty, then stand back and watch as it falls apart on you, or have to perform frequent maintenance to prevent that from happening. With iron doors, you not only get beauty, but also durability. Iron is not a high-maintenance metal, so you won’t have to devote hours to polishing and caring for it. As with all metal, wrought iron is prone to rust, but you have the option of getting it coated so it will have an easier time resisting it. Aside from that, iron is strong, sturdy, and will serve you well for many years.